Discover all the plants, seeds, surplus produce, gardening materials and Incredible Edible containers shared by fellow gardening neighbors. Check what other gardeners need, and consider sharing it. View all planned events in your area. Enjoy some food to share from the Incredible Edible movement in your area. There is no offers in this area. Since PlantCatching is relatively new, this is probably because not many gardeners know about it. You can help by spreading the word and this page can help you too. Of course, you can also be the first to act in your own area. Why not give a perennial that has to be divided or a seed packet? This will place a marker on the map, generate activity and make people want to do the same. 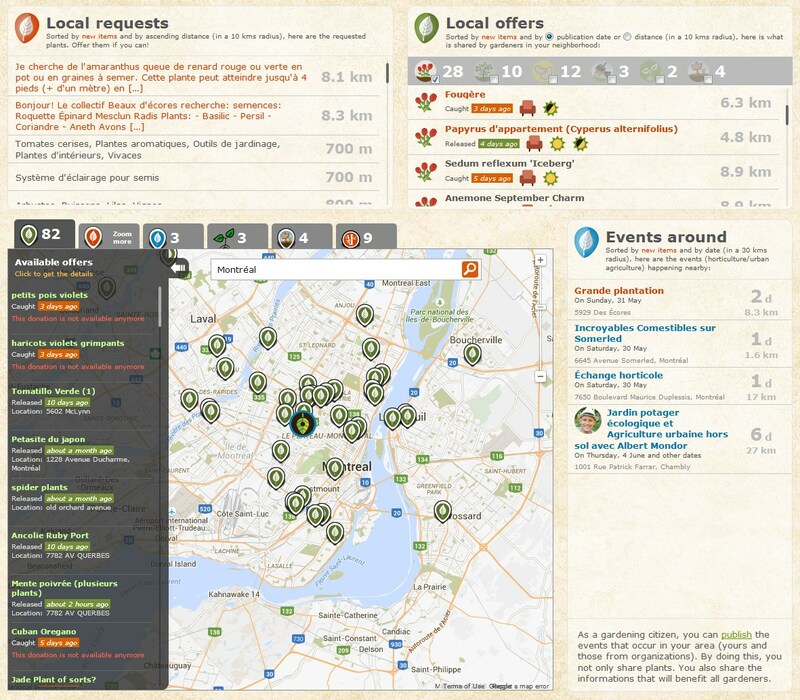 As a gardening citizen, you can add the events that occur in your area (yours and those from organizations). By doing so, you not only share plants but also the informations that every gardener needs. Note that you need an account to do so. There is no planned events in this area. There is no Incredible Edible containers in this area. There is no shared gardens in this area. There is no professional bamboo accounts in this area. Consider sharing too: let's build an incredible plant and food resource! With your own account, you get powerful proximity tools that show you in realtime what happens in your area. You can also search by keywords, create your gardener profile, set plant requests and publish events. Je suis très content d'avoir trouvé prenneur pour mes papyrus! Ça aurait été dommage de devoir les jetter - en fait, je crois que je n'aurais jamais réussi à le faire, donc tout est bien qui fini bien! Super site. C'est juste platte qu'il n'y aie pas autant de participant que j'aurai voulu dans mon secteur. merci!